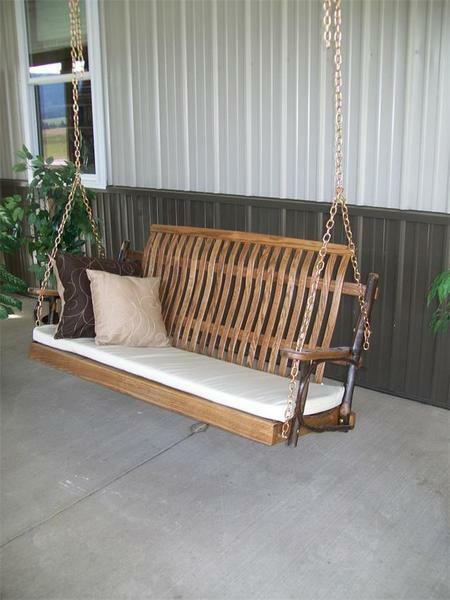 Create an outdoor oasis on your front porch with our Amish Hickory Wood Swing. Enjoy swings the nights away on this comfortable porch swing. This swing is Amish made from Hickory Wood with a beautiful dark walnut outdoor finish. Zinc plated hardware and yellow zinc chains are used for rust resistance. Order our Amish outdoor furniture online or over the phone with one of our helpful sales associates. Shop all our beautiful Amish porch swings. Pair this swing with our hickory rockers to create a cozy spot on the front porch. Some easy assembly is required for this porch swing. We usually ship this swing with UPS or FedEx. It ships for under $50 which makes for an affordable porch swing.